Q2. Identify the functional group in following compound. Q3. What is the general mathematical formula for Alkyne? Q4. Name the process by which unsaturated Carbon compounds are converted into Saturated Carbon compounds. Q5. Write chemical equations representing methane Combustion? Q1. Give a chemical test to distinguish between butter and cooking oil. Butter and cooking oil can be distinguished by using alkaline KMnO4. Being unsaturated only cooking oil decolourises the pink colour of alkaline KMnO4 where as butter does not, because it is saturated. Bromine water test is also used where brown colour is discharged by the cooking oil. Q2. Give a chemical test to distinguish between butter and cooking oil. Butter and cooking oil can be distinguished by using alkaline KMnO4. Being unsaturated only cooking oil decolourises the pink colour of alkaline KMnO4 whereas butter does not, because it is saturated. Q3. An organic compound 'X' reacts with sodium metal to form sodium ethoxide and a gas 'Y'. (a) Identify 'X' and 'Y'. (b) What happens when ethanol is heated at 443 K with conc. H2SO4? Q4. What is meant by saponification? Give an example. It is the reaction that forms Soap. When an ester reacts with water in presence of a base, a salt of carboxylic acid, and an alcohol are produced. Such a reaction is called saponification. For example : When ethyl ethanoate is heated with a solution of sodium hydroxide, sodium ethanoate and ethanol are produced. (ii) Functional Group is Bromine. Q2. What is meant by Isomers ? 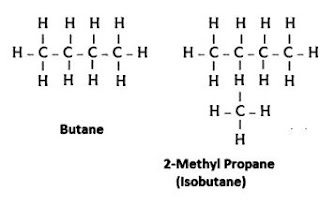 Draw the structure of two isomers of butane, C4H10. Explain why we cannot have isomers of first three members of alkane series. Isomers are the compounds which have the same molecular formula but different structural formula. The parent chain should have the most number of carbon atoms. The branching cannot be done from the first on the last atom carbon atom of the structure. Q3. What are covalent compounds ? Why are they different from ionic compounds? List their three characteristics properties. (a) Covalent compounds are those compounds which are formed by sharing of electrons between two atoms/which contain covalent bonds. (b) Covalent compounds are different from ionic compounds because the ionic compounds are formed by the transference of electrons. (i) Generally have low melting and boiling points. (ii) Generally insoluble or less soluble in water but soluble in organic solvents. Q4. Why homologous series of carbon compounds are so called ? Write chemical formula of two consecutive members of a homologous series and state the part of these compounds that determines their (i) physical properties, and (ii) chemical properties. The two consecutive members of alkane series are methane (CH4) and ethane (C2H6). These members of a homologous series show gradual change in their physical properties with increase in molecular masses. Their molecular masses and functional groups determine their physical and chemical properties, respectively. Q1. What are micelles ? Why does it form when soap is added to water? Will a micelle be formed in other solvents such as ethanol also ? State briefly how the formation of micelles helps to clean the clothes having oily spots. Soap molecules have two ends-at one end is the hydrocarbon chain which is water repellent, whereas at the other end there is the ionic part which is water soluble end. When soap is dissolved in water if forms a group of many molecules, known as micelle. These micelles are formed because their hydrocarbon chains come together and the polar ends are projected outwards. Micelle formation in ethanol will not occur because the hydrocarbon chain end of the soap will dissolve in ethanol. Soaps in the form of micelle are able to dean dirty clothes having oily spots, as the oily dirt is collected in the centre of the micelle, which forms an emulsion in water and on rinsing, the water washes away the micelles with dirt attached to them. Q2. 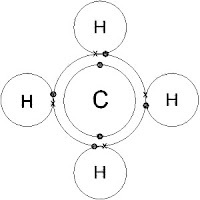 Make the structure of methane by showing sharing of electrons between carbon and hydrogen atoms. How could you convert methane into chloroform by substitution reaction? Explain with the help of chemical reactions. Hydrogen atoms can form one covalent bond, while carbon atoms can form four covalent bonds. Four pairs of electrons are shared in a methane molecule (CH4). When a mixture of methane and chlorine is exposed to ultraviolet light - typically sunlight-a substitution reaction occurs and the organic product is chloromethane. However, the reaction doesn't stop there, and all the hydrogens in the methane can in turn be replaced by Cl.